Omega offers a robust line of 2-phase biploar high torque stepper motors ranging in frame size from NEMA 11 to NEMA 34. Most of our models are the high torque style, with holding torques up to 1845 oz-in. 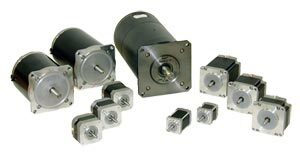 All step motors conform to industry-standard NEMA mounting dimensions, and are offered with a range of well-featured, compatible drives and indexers. With the exception of our two smallest motors (OMHT11-013, OM5014-842), all of our high torque step motors are optimized for microstepping: they can achieve a stepping resolution of up to 51,200 steps/revolution (.007° per step) when operated by one of our microstepping drives. Although it is not necessary, these motors can be fitted with one of our incremental encoders, which can aid in stall detection and prevention. Most of the stepper motors are 8-lead motors, offering the flexibility of either series or parallel connection. The high torque motors should be series connected for best torque at low speeds, and parallel connected for best torque at higher speeds. Note: Optional encoders can only be added to double shaft versions. Encoders offered are differential encoders with line drivers. These provide two channels of signals with complementary signals. Versions with index also offer Z-channel and its complementary signal.